Demetria Devonne Lovato, shortened to Demi Lovato, was born in 1992. She began her acting and singing career when she was only six, on the tv show "Barney & Friends". There she met and became best friends with her co-star Selena Gomez. She has since been the star on several Disney productions including "Welcome to Mollywood", "Camp Rock" and several others. Demi plays both piano and guitar. As you will see below she also has a successful career as a singer. She has written many of her songs herself. Some of them are co-written by the Jonas Brothers. You will find the guitar chords and tabs to her songs right here. Enjoy and have fun playing these Demi Lovato guitar tabs and chords. 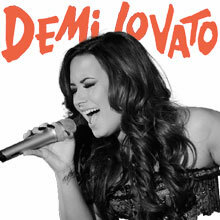 Demi is skilled guitar and piano player. In concert she plays an acoustic Gibson guitar. Use these chords and tabs to master her style.